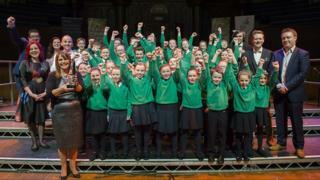 A primary school from Drumgreenagh in County Down has made it to the semi-finals of Britain's Got Talent. Thirty-nine pupils from St Patrick's Primary School were named as one of the acts who had won through auditions during Saturday night's episode on ITV. The choir - which is made up of pupils aged from eight to 12 - was named BBC Radio Ulster School Choir of the Year in 2016. The semi-finals get under way on Monday at 19:30 BST. "It's all just been a little bit crazy, so unbelievable, it's absolutely fantastic," the school's principal Sorcha Lyness said. "They're just buzzing, absolutely buzzing, there's such a great atmosphere, everybody's over the moon and just can't believe that they've made it this far. "So we're just telling them to enjoy every minute of it, it's a once in a lifetime experience to be here, so just go out and make the most of it." She added: "I think it's just the teachers who are showing the nerves, the children are not showing any signs of nerves yet, they're coping really well taking everything in their stride. "As adults I think we realise how big this potentially is and that's what's making us feel nervous, but the children are 100%, they're great." She said the fact the school was so small made it an even better achievement. "We don't have the numbers to pick and choose from - we have 80 pupils in the school and we have 39 pupils in the choir, so almost half of the school are in the choir, so it's an amazing achievement," she said. "We've just finished a rehearsal on stage so it's really exciting to see them up on stage with the lights and the set behind them. "We actually got to sit in the judges seats to watch them perform for the rehearsal, so it's all very real at this moment in time."